JAKARTA - The Indonesian central bank, Bank Indonesia, on 9 july 2009 has officially launched the new 2.000 Rupiah banknote. The banknote with a value of 2.000 Rupiah is an addition to the current set of available values of 1.000, 5.000, 10.000, 20.000, 50.000 and 100.000 Rupiah. Bank Indonesia states that the banknote is fulfilling a need among the Indonesian population to have a value between the much-used values of 1.000 and 5.000 Rupiah. The mainly gray-colored banknote features an image of Prince Antasari on the front. He is a national hero from Banjarmasin in South Kalimantan. At the back side is a drawing of a traditional Dayak dance. 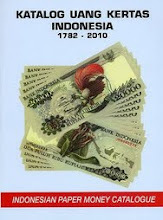 The display of a national hero is a continuation of the current set of banknotes already in circulation, which all feature national Indonesian heroes. The banknote has a watermark of the prince and has many other security features just like other current Indonesian bank notes. Front side of the new 2.000 Rupiah banknote featuring Prince Antasari. Back side of the new 2.000 Rupiah banknote featuring Prince Antasari.